Platinum Emerald Cut Diamond Eternity Band - Platinum diamond eternity band made with all matching emerald shape diamonds. In size 6.0 the ring holds approximately 17 diamonds with approximate total weight of 8.5ct. Diamonds are graded as VS in clarity F in color.. Platinum Eternal-Love Eternity Band. Platinum, 2.0CT - Eternal-Love diamond eternity band in platinum. Diamonds are set in shared prongs with a draped side profile displays an endless row of floating round brilliant-cut diamonds. The diamond total weight is approximately 2.10ct in size 6.0. 14K Eternal-Love Eternity Band Rose Gold, 2.40CT - Eternal-Love eternity band in 14K rose gold. 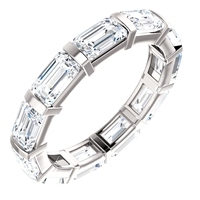 The band holds 24 Asscher cut brilliant diamonds with total weight of 2.4CT. The diamonds are graded as minimum H in color and VS in clarity. 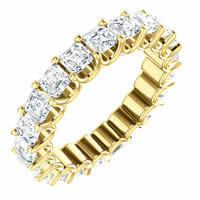 14K ternal-Love Eternity Band 2.40CT - Eternal-Love eternity band in 14K yellow gold. The band holds 24 Asscher cut brilliant diamonds with total weight of 2.4CT. The diamonds are graded as minimum H in color and VS in clarity. 14K Eternal-Love Diamond Eternity Band - Eternal-Love diamond eternity band in 14K white gold. Diamonds are set in shared prongs with a draped side profile displays an endless row of floating round brilliant-cut diamonds. The diamond total weight is approximately 2.90ct in size 6.0. Eternal-Love Eternity Band. 1.0CT TW. - Eternal-Love diamond eternity band in 14K white gold. Diamonds are set in shared prongs with a draped side profile displays an endless row of floating round brilliant-cut diamonds. The diamond total weight is approximately 1.0ct in size 6.0. Platinum Eternal-Love Eternity Band. 3.40CT - Eternal-Love eternity band in platinum. The band holds 21 Asscher cut brilliant diamonds with total weight of 3.4CT. The diamonds are graded as minimum H in color and VS in clarity. Eternal-Love Eternity Band. 14K White Gold. 2.40CT - Eternal-Love eternity band in 14K white gold. The band holds 24 Asscher cut brilliant diamonds with total weight of 2.4CT. The diamonds are graded as minimum H in color and VS in clarity. Eternal-Love Eternity Band. Platinum 1.0CT TW. - Eternal-Love platinum diamond eternity band. Diamonds are set in shared prongs with a draped side profile displays an endless row of floating round brilliant-cut diamonds. The diamond total weight is approximately 1.0ct in size 6.0. Gold Eternal-Love Eternity Band. 3.50CT - Eternal-Love eternity band in 14K yellow gold. The band holds 18 round brilliant diamonds with total weight of 3.5CT. The diamonds are graded as minimum H in color and SI1 in clarity. 18K Rose Gold Eternal-Love Eternity Band. 2.40CT - Eternal-Love eternity band in 18K rose gold. 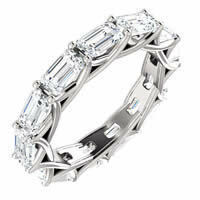 The band holds 24 Asscher cut brilliant diamonds with total weight of 2.4CT. The diamonds are graded as minimum H in color and VS in clarity. Eternal-Love Eternity Band. 1.0CT TW - Eternal-Love diamond eternity band in 14K gold. Diamonds are set in shared prongs with a draped side profile displays an endless row of floating round brilliant-cut diamonds. The diamond total weight is approximately 1.0ct in size 6.0. 14K Eternal-Love Eternity Band. 2.10CT - Eternal-Love diamond eternity band in 14K white gold. Diamonds are set in shared prongs with a draped side profile displays an endless row of floating round brilliant-cut diamonds. The diamond total weight is approximately 2.10ct in size 6.0. Platinum Eternal-Love Platinum Eternity Band. 5.25CT - Eternal-Love eternity band in Plainum. The band holds 16 round brilliant diamonds with total weight of 3.5CT. The diamonds are graded as minimum H in color and VS2 in clarity. Eternal-Love Eternity Band. 18K Gold. 3.40CT - 18K yellow gold Eternal-Love eternity band. The band holds 21 Asscher cut brilliant diamonds with total weight of 3.4CT. The diamonds are graded as minimum H in color and VS in clarity. 18K Eternal-Love Eternity Band. 2.90CT - Eternal-Love diamond eternity band in 18K white gold. Diamonds are set in shared prongs with a draped side profile displays an endless row of floating round brilliant-cut diamonds. The diamond total weight is approximately 2.90ct in size 6.0. Eternal-Love 18K Eternity Band 1.0CT TW - Eternal-Love diamond eternity band in 18K gold. Diamonds are set in shared prongs with a draped side profile displays an endless row of floating round brilliant-cut diamonds. The diamond total weight is approximately 1.0ct in size 6.0. 14K Eternal-Love Eternity Band - Eternal-Love diamond eternity band in 14K yellow gold. Diamonds are set in shared prongs with a draped side profile displays an endless row of floating round brilliant-cut diamonds. The diamond total weight is approximately 2.10ct in size 6.0. Rose Gold Eternal-Love Eternity Band. 1.0CT TW - Eternal-Love diamond eternity band in 14K rose gold. Diamonds are set in shared prongs with a draped side profile displays an endless row of floating round brilliant-cut diamonds. The diamond total weight is approximately 1.0ct in size 6.0. 14K Eternal-Love Eternity Band White Gold. 3.5CT - Eternal-Love eternity band in 14K white gold. The band holds 18 round brilliant diamonds with total weight of 3.5CT. The diamonds are graded as minimum H in color and SI1 in clarity. Eternal-Love Eternity Band in Platinum. 3.50CT - Eternal-Love eternity band in platinum. The band holds 18 round brilliant diamonds with total weight of 3.5CT. The diamonds are graded as minimum H in color and SI1 in clarity. Eternal-Love Diamond Eternity Band. 2.90CT 18K Gold - Eternal-Love diamond eternity band in 18K yellow gold. Diamonds are set in shared prongs with a draped side profile displays an endless row of floating round brilliant-cut diamonds. The diamond total weight is approximately 2.90ct in size 6.0. Eternal-Love Eternity Band 14K 2.90CT - Eternal-Love diamond eternity band in 14K yellow gold. Diamonds are set in shared prongs with a draped side profile displays an endless row of floating round brilliant-cut diamonds. The diamond total weight is approximately 2.90ct in size 6.0. Eternal-Love Eternity Band. 18K. 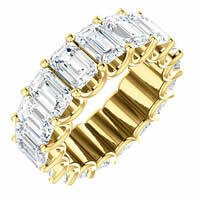 3.50CT - Eternal-Love eternity band in 18K yellow gold. The band holds 18 round brilliant diamonds with total weight of 3.5CT. The diamonds are graded as minimum H in color and SI1 in clarity. 18K Gold Eternal-Love Eternity Band. 2.40ct - Eternal-Love eternity band in 18K yellow gold. The band holds 24 Asscher cut brilliant diamonds with total weight of 2.4CT. The diamonds are graded as minimum H in color and VS in clarity. 18K White Gold Eternal-Love Eternity Band. 2.40CT - Eternal-Love eternity band in 18K white gold. The band holds 24 Asscher cut brilliant diamonds with total weight of 2.4CT. The diamonds are graded as minimum H in color and VS in clarity. Eternal-Love 18K White Gold Eternity Band. 1.0CT TW - Eternal-Love diamond eternity band in 18K white gold. Diamonds are set in shared prongs with a draped side profile displays an endless row of floating round brilliant-cut diamonds. The diamond total weight is approximately 1.0ct in size 6.0. Platinum Eternal-Love Eternity Band. 2.90CT - Eternal-Love diamond eternity band in 950-platinum. Diamonds are set in shared prongs with a draped side profile displays an endless row of floating round brilliant-cut diamonds. The diamond total weight is approximately 2.90ct in size 6.0. Eternal-Love Eternity Band. Rose Gold 1.0CT - Eternal-Love diamond eternity band in 18K rose gold. Diamonds are set in shared prongs with a draped side profile displays an endless row of floating round brilliant-cut diamonds. The diamond total weight is approximately 1.0ct in size 6.0. Platinum Eternal-Love Eternity Band. 2.40CT - Eternal-Love eternity band in platinum. The band holds 24 Asscher cut brilliant diamonds with total weight of 2.4CT. The diamonds are graded as minimum H in color and VS in clarity. Platinum Emerald Cut Eternity Band - Platinum diamond eternity band made with all matching emerald shape diamonds. In size 6.0 the ring holds approximately 22 diamonds with approximate total weight of 7.5ct. Diamonds are graded as VS in clarity F-G in color. 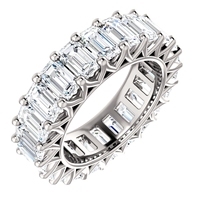 Platinum Emerald Cut Eternity Band - Platinum diamond eternity band made with all matching emerald shape diamonds. In size 6.0 the ring holds approximately 11 diamonds with approximate total weight of 3.75ct. Diamonds are graded as VS in clarity F-G in color. Platinum Diamond Eternity Band - Platinum diamond eternity band made with matching emerald shape diamonds. In size 6.0 the ring holds 13 emerald cut diamonds with approximate total weight of 4.50ct. The diamonds are graded F-G in color and VS1-2 in clarity. "Incredible experience!! It was exactly as I ordered it in perfect condition! It was sent diligently and transfer of shipping location was smooth! The individual I spoke to was VERY nice and helpful she made the order process very easy! Thank you!" Jasmine B., FL.